Where gravity is concerned, consumers of Cloudsurfing (66'43") seem to have choices not open to the rest of the listening public. 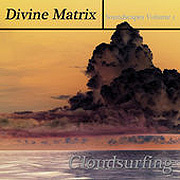 Steve Barnes records under the name Divine Matrix, and promises to fly you into worlds more interesting than your own. Barnes' releases hope to help us sense the environmental interconnectedness that surrounds us. Cloudsurfing is meant to represent the more Ambient/Chill side of his musical personality, and its smooth power leaves its mark quietly. The album unfolds in a series of luminous forms - with each of its eight tracks being a microcosm of texture, atmosphere and place. It will be difficult not to feel one with these soundscapes, as its swirl of sounds manages to implicate the listener. Sustaining synthesizer notes hold, then expand in slow, pulse calming arrangements. Rumbling drones support ethereal harmonies, as echoing tones wander loose across native lands. Celestial singing draws us skyward, while spare sequencer lines lightly ricochet amidst breathing chords and wildlife recordings. An exercise in pure craft, Cloudsurfing is a bracing expedition into the sonic realm. Its songs seem from an unwritten sky chart, as we drift with Barnes along unmapped currents. Though you may feel like the only person on this journey, Cloudsurfing, and its charming elemental force, helps us to remember the larger world we inhabit, but have forgotten.